Welcome to our Game In Progress review of Arkane Studios’ Prey, a new sci-fi horror game from the developer that produced Dishonored. This final installment covers the entire game and discusses its twist ending in detail. You can find the rest of our Prey review series here. If there’s anything separating a good twist ending from a bad twist ending, it has to be logical consistency. People hate on The Life Of David Gale because, ultimately, Kevin Spacey’s plan made no damn sense and its existence weakened the film’s message. The Village’s revelation, surprising only to anyone watched without realizing it was directed by M. Night Shyamalan, works as an allegory for how not to react to tragedy, but it’s shot through with impracticalities. 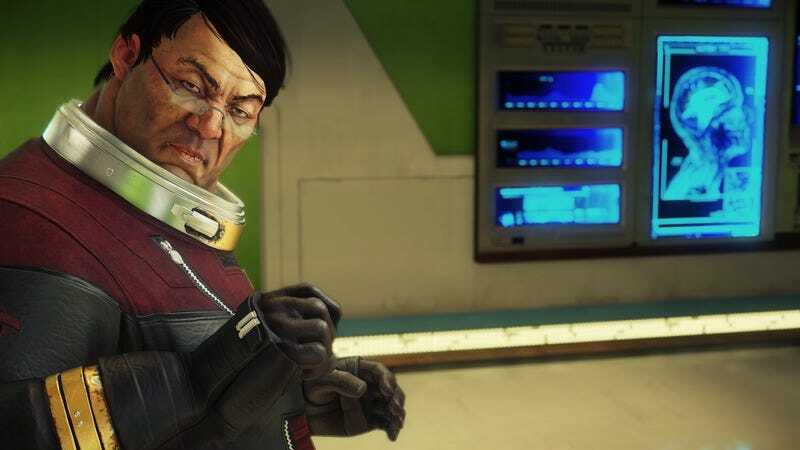 By those standards, Prey’s big post-credits twist, while enacting a pretty dangerous cliché, is surprisingly well earned. Let’s recap for a minute: After trudging your way through the game’s aggravating final hours and reaching one of several endings, all of which are marked by an abrupt shift to a brief and incredibly shoddy cutscene, the credits begin to roll. Once they’re done, the game starts loading up again, with the player in a “Hidden Location.” When you gain control, you’re strapped to a chair and Alex Yu, one of the main players in the story, is staring down at you alongside several robots with familiar voices. All you can do is look around, and wouldn’t you know it, your hands are made of pulsating black sinew. Turns out, you’re not Morgan Yu, and you never were. The whole game was a simulation based on Morgan’s memories and used by Alex to test whether the Typhon could be imbued with humanity’s one great gift: empathy. All those choices you made—sparing enemies, saving allies and acting out their sentimental requests all at your own risk—were part of an experiment meant to create a Typhon trustworthy enough to ally with the last remnants of humanity in their fight against the aliens, who’ve invaded and seemingly conquered Earth. If you were nice enough to the humans in the game, Alex and the robots will free you. You then have the choice to either kill him or shake his hand. There are loose ends, to be sure. How did Alex make it off Talos-1? If they’re talking to you as operators, their consciousness seemingly transferred into robotic shells a la January, does that mean Danielle Sho, Dr. Igwe, and the rest of the survivors you met actually died on board? Assuming the game was all one big set up for a sequel that takes place on Earth, what are the canonical implications of choosing to kill Alex as the Typhon test subject? And then there’s the biggest question of all: What happened to the actual Morgan Yu, and what were the choices he made? But if you’re seeking evidence of what makes the ending work, look no further than my last entry in this series. I played right into the developers’ hands, and even though I was picking up the breadcrumbs they had left behind, I never would have predicted this particular turn of events. It’s not the shock value of the twist that matters, but how it fits into the story of humanity and struggle that we discussed. There’s a thematic consistency to the game that, while not all that original, is very strong and woven deeply into not just the story, but the way you play and the decisions you make. That inner-conflict between survival and sacrifice really is everything, and as Alex says during the post-credits scene, the choices you made are all that mattered because, in the end, that’s quite literally the only reason you were going through this simulation. Given its shared lineage with BioShock, perhaps it shouldn’t be all that surprising that Prey goes face-to-face with the never-ending conversation about the futility of choice in video games. Rather than glossing over your path a la Mass Effect 3 or attempting to lean back and thumb its nose at players with a “Would you kindly” moment, Prey dabbles in both sides of the choice argument. All the decisions you made under the presumption that they might have some sort of impact on whether the Typhon reach Earth are rendered pointless. The planet was already screwed, and the things you did were just part of an elaborate charade. At the same time, those choices now have a new meaning, one that falls more directly in line with all of Prey’s constant prodding at your empathy barometer. The big reveal is itself an almost laughably ham-fisted moment, with Alex and the robots staring down at you and running through your decisions. They’re taking the place of the game’s developers—Alex even postulates that we incorrectly assumed we were dreaming and that nothing we did mattered—and passing judgment on the things you’ve done. If your choices align with their definition of humane, you’re able to make that final decision: to seek vengeance against these animals who’ve been experimenting on you or to take pity on them and join their cause. It makes the storyline of Luka, the psychopathic murderer we previously talked about, even more interesting. He’s not a foil, as I believed at the time, but a direct human analog for what your Typhon character turns out to be: a remorseless, violent creature who’s been forced to undergo transformative experimentation. If you end the game by lashing out, which you have every right to do given the circumstances, you really are living Luka’s story beat by beat. The twist is great about spreading that kind of recontextualization to every corner. It frames the game with a sense of symmetry, as you start by breaking out of a simulation—technically a simulation within a simulation—and end the same way. It’s also a knowing subversion of the ethically questionable experimentation Transtar was practicing aboard Talos-1 when they injected the Typhon’s predatory abilities into humans. Now, Alex’s only option to save mankind and undo the invasion he and Morgan have incurred with that ungodly endeavor is to reverse it and see if they can give the Typhon our own sense of humanity and understanding. The ending even casts a different light on certain design elements, like the presence of so many alternate routes through areas and into locked rooms. Of course there wouldn’t be all that many hard roadblocks to your progress in this simulation. What counts is what you do, not how you do it. The twist was a bold move that can hold up regardless of whether Prey ever receives the sequel it seems to be implying. While it dives right into the reviled “It was all a dream!” cliché, the developers at Arkane did enough work setting it up with thorough, multi-faceted exploration of the game’s themes that it actually feels earned and like a natural extension of the questions Prey was posing.